Most of us who know and follow Jesus want to tell others about him, to share our faith. We want to live life on mission, obeying Jesus' final command to us: "Go into all the world and make disciples." But when it comes to actually engaging in evangelism, we hesitate. We get intimidated, uncertain, or even confused. Sharing our faith should be natural and easy, but it isn't always. 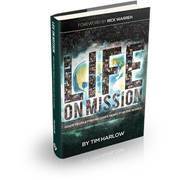 This study guide is designed to be used with the Life on Mission DVD.